RPP (Rapid Pathfinder Program) is a secret technological development satellite of the NRO. The NRO said, RPP part of a science and technology development effort to lay the groundwork for future systems, but did not publish any specifics. Reportedly it is a small, low-cost bus carrying advanced technology component payloads. 95% of the satellite are heritage parts. 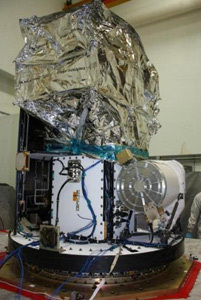 The satellite structure measures 50 × 50 × 50 cm and weights 235 kg with payload. The payload consists of advanced dosimeters to characterize the space environment from a 1,200 km orbit. Rapid Pathfinder went from program design review to launch ready in less than two years at a cost of less than $20M. It was built on an Aquila-M1 bus by Millennium Space Systems, Torrance, California. The company also integrated the classified instruments with the bus. The satellite was successfully launched in February 2011 on a Minotaur-1 booster from Vandenberg AFB. It was still operational in January 2014. Note: The NROL designations refer to the launch, not to the payload.